The NFL International Series logo used between 2009 and 2016; the year was updated annually. Initially, all games in the International Series were held in London. Wembley Stadium was the exclusive home stadium for International Series games from 2007 to 2015 and will continue to host at least two NFL games through at least 2020; beginning in 2016, the series began expanding to more stadiums, first to Twickenham Stadium in London (2016–2017) and to Estadio Azteca in Mexico City (2016–2021) and eventually to Tottenham Hotspur Stadium in London (2019–2027), with possible future plans to expand the series to Germany and/or Canada. Prior to 2005, the NFL's primary method of promoting its game abroad was through the American Bowl, a series of preseason games played around the world, and NFL Europe, a developmental league based in Europe. The American Bowls ended in 2005 (though a similar China Bowl was planned for 2007 before being canceled), while NFL Europa (as it was known for its final season) folded in 2007. On October 2, 2005, the Arizona Cardinals defeated the San Francisco 49ers by a score of 31–14 at Estadio Azteca in Mexico City, Mexico under the name "NFL Fútbol Americano". It was the first regular season NFL game held outside the United States. The game drew the NFL's highest game attendance at the time with 103,467 spectators. Roger Goodell, the commissioner of the National Football League, has considered expanding the league's appeal overseas ever since the end of NFL Europa. Goodell has openly discussed the idea of holding a future Super Bowl game in London. The NFL also investigated the possibility of adding a 17th regular season game to all teams, taking the place of the fourth pre-season game. Waller notes that there will not be 16 different venues for the 17th games. More likely would be a "mini-season ticket" of perhaps four games in one city or country. There was discussion that this "17th game" could take effect as early as the 2009 NFL season; however, 2010 would be the earliest this could be implemented because of concerns about playing on Labor Day or over the 2010 Winter Olympics, the league's rigid scheduling formula, and the league's collective bargaining agreement (CBA). League officials were pondering moving a second existing game abroad for the 2010 season, but eventually abandoned it due to the ongoing CBA negotiations. The league eventually abandoned its attempt to expand the NFL season via CBA negotiations, and the new CBA enacted in 2011 has kept the NFL schedule at 16 games as of 2017. Games in the United Kingdom are broadcast by the BBC and Sky Sports either live on BBC2 or online via the BBC Sports website and interactive TV and on Sky Sports Action. On radio the games are broadcast by BBC Radio 5 Live Sports Extra, with Arlo White commentating. The games have been popular, with tickets for the two games per season selling out in two days, nine months in advance. According to the NFL, only 3% of those attending the London games are Americans or American expatriates, while 22% are from London and 60% from elsewhere in Britain. Ticket prices are from £35 for end zone seats to £100 for lower sideline seats. A team that plays a home game in London sells a cheaper season ticket package for its own stadium with seven regular season games rather than the usual eight. Each designated home team receives US$1 million for giving up the home game. On October 11, 2011, the NFL owners approved playing NFL games in Great Britain through the year 2016. This stated that a home team could visit every year for up to five years but visitors could only visit once every five years. However, in 2015 the Detroit Lions returned to London as visitors in an apparent disregard for this rule. Subsequently, an agreement has been reached to play internationally through 2025. The Buffalo Bills received a unanimous vote of approval to play a series of regular and preseason games at Rogers Centre in Toronto from 2008 to 2017. This was separate from the regular International Series as arrangements are made by the team as opposed to the league as with the International Series. The Bills' Toronto Series was mutually terminated after the 2013 contest. Due to significant time zone differences, from 2007–2015 teams playing in London would have their bye week in the following week after their game in London. For 2016, the Indianapolis Colts volunteered to play a game the week after their London game, preferring to have their bye week later in the season. The Colts playing the week after London was also done by the NFL as a test to see team fatigue for evaluation of an eventual London franchise. As Mexico City is within the Central Time Zone—eight NFL teams play home games in Central Time and the rest are within two hours of it—no bye week would be needed for those teams, though they may still by chance be scheduled their regular bye week anyway. For 2017, three teams playing in London (Baltimore, Jacksonville, and Miami), would have games immediately following their International Series game. In all three cases, the teams playing after their International Series game are based on the East Coast of the United States and will either be home or (in the Jaguars case) playing in East Rutherford, New Jersey. In 2018 and 2019 all teams once again received their bye immediately following their international game. Due to NFL rules, teams that are playing in temporary homes as part of a relocation or that have recently been awarded the Super Bowl are required to play a home game internationally. The Los Angeles Rams, upon relocating from St. Louis, agreed to host an international game from 2016–2019, while their new stadium is being built. The Los Angeles Chargers, who will be sharing the stadium with the Rams once it is completed, will also host an international game in 2018 and 2019, only getting out of the 2017 game because the team had executed its out clause to move from San Diego after the 2017 International Series games had been announced. The Raiders, who will spend the 2019 off-season in limbo due to the expiration of their stadium deal in Oakland and the lack of an NFL-ready stadium in their eventual home in Las Vegas, have also agreed to annual international games. The rule was not in place when the Minnesota Vikings were using TCF Bank Stadium so they had no requirement to host abroad. NFL rules also require the designated home team for each international game to have their home stadium reserved for use in the event that a game cannot be played at the international site. The Miami Dolphins hosted the New York Giants at Wembley Stadium in London, England on October 28, 2007. The Giants defeated the Dolphins 13–10 in the first regular season NFL game held outside North America. The first 40,000 tickets sold out for the game in the first 90 minutes of sales. The game was aired regionally on Fox. A single game was held in London each year through 2011. Like the 2007 game, each was televised nationally in England, but only regionally in the United States. On January 20, 2012, NFL commissioner Roger Goodell confirmed that from 2012 to 2014, the St. Louis Rams would play one of their eight home games each year at Wembley Stadium. However, on August 13, 2012, the team announced that they would not play the proposed games in London in 2013 and 2014, only the 2012 game against the New England Patriots that had already been scheduled. Goodell had previously proposed the use of certain regular teams in the International Series in an effort to build a fan base for those teams, raising the prospect of a permanent NFL team on the British Isles. An NFL bid to become anchor tenants of London's Olympic Stadium failed. The Jacksonville Jaguars took the Rams' place and agreed to play a home game in London for four seasons from 2013 through 2016. With this announcement also came news that the NFL were working to schedule a second UK game from 2013 onwards. (The Jaguars later extended their agreement with Wembley Stadium through 2020 in an agreement announced in October 2015.) In October 2012, it was announced that the Jaguars would host the San Francisco 49ers and the Minnesota Vikings would host the Pittsburgh Steelers, marking the first season with multiple games in London. The NFL played three international games for the 2014 season, including one game with an earlier 9:30 am ET start, which allowed for an afternoon game, rather than an evening game, in London. This timeslot proved to be successful as all London games in 2015 and 2016 were also scheduled at 9:30 am ET. Three games were again scheduled in 2015 – including the series' first division game between the New York Jets and the Miami Dolphins. NFL London and Mexico Games logos, first used in 2016 in Mexico and 2017 in London. On July 8, 2015, the NFL and Tottenham Hotspur F.C. announced they had reached a 10-year deal to host at least two London Games a year at the new Tottenham Hotspur Stadium from its opening season in 2018. Additionally, on October 7, 2015, the league announced that a resolution had been passed to schedule international games at additional locations to London until 2025. Subsequently, on October 22, 2015 it was confirmed that at least two games per season would remain at Wembley through at least 2020 and that the Jacksonville Jaguars will continue to play a home game there annually throughout the agreement. Another stadium deal was confirmed on November 3, 2015, when the league announced they had reached an agreement with England's Rugby Football Union to host regular season games at Twickenham Stadium from 2016 onwards, with a minimum of three, and as many as five games to be held over the initial agreement period of three years. In 2016, the Oakland Raiders hosted the Houston Texans on November 21 at Estadio Azteca in Mexico City, at the first International Series game played in Mexico. Previously, the Houston Texans and Pittsburgh Steelers had expressed interest in playing a game at Estadio Azteca (or possibly Estadio Olímpico Universitario) in Mexico City, although Houston was not prepared to give up a home date. It was televised as part of ESPN's Monday Night Football, marking the first MNF game broadcast from outside the United States, and ESPN's second broadcast from Mexico City since the 2005 Fútbol Americano game (which was televised as part of ESPN's former incarnation of Sunday Night Football). The 2016 game between the Redskins and Bengals was the first International Series game to go into overtime, the first to end as a tie, and had at the time the highest attendance of all International Series games (later surpassed by the 2017 game between the Ravens and Jaguars, which drew an attendance of 84,592). In January 2018, it was announced that three games would be played in London that year, with two at Wembley and the other the first game at Tottenham Hotspur's new stadium. However, it was later confirmed that the opening of the new Tottenham Hotspur Stadium would be delayed and therefore all three games would be held at Wembley. Having already fulfilled the minimum three-game requirement for Twickenham Stadium in 2017, it will no longer host games. The Mexico City date and opponents were not announced at that time, but were later confirmed as the Los Angeles Rams playing as designated home team against the Kansas City Chiefs. This game was subsequently moved to Los Angeles due to poor field conditions at Estadio Azteca. In October 2018, the league confirmed four London Games would take place in 2019. Wembley Stadium would host two and Tottenham Hotspur Stadium would host the remaining two. The Jacksonville Jaguars would return to Wembley Stadium for the seventh consecutive year in line with their annual commitment. Prior to the start of the 2019 season, the "extreme long shot" possibility arose that the former Oakland Raiders, who lack a stadium for 2019, could play all of their home games in London in 2019; they are already slated to host one game abroad. Cost and logistics concerns leave this scenario unlikely. Upon completion of the 2019 NFL season, only the Green Bay Packers will not have played in an International Series game. ^ The November 19, 2018 game was scheduled to be played between the Kansas City Chiefs and the Los Angeles Rams at Mexico City's Estadio Azteca, but poor field conditions forced the league to move the game to the Rams' home stadium, Los Angeles Memorial Coliseum. Within the United Kingdom, aside from London, potential candidates for hosting NFL games include Millennium Stadium in Cardiff, Wales; and Murrayfield in Edinburgh, Scotland. Other prime locations to get games would be Croke Park in the Republic of Ireland (Ireland has already hosted the NCAA Emerald Isle Classic, a college football game similar to the International Series, and Steelers owner Dan Rooney was once an ambassador to the country), Germany (which hosted five teams in NFL Europa at the time of its dissolution in 2007 and whose national American Football team won both the 2010 and 2014 European Championship), China; Brazil, Australia and Canada (Canada hosted the Bills Toronto Series from 2008 to 2013). In 2007, NFL senior Vice President Mark Waller doubted Asia or Australia would be targeted because of travel concerns, but did not dismiss the possibility. The league had planned to host a game in China in 2018 with the Los Angeles Rams as the home team against the San Francisco 49ers. However, the game in Germany was scrapped in favor of adding a 4th game in London in 2017. The potential game in China was postponed (the third time the league has postponed playing in China, following failed attempts in 2007 and 2009) to being aimed for the 2019 season to coincide with the league's 100th anniversary. The league has indicated that a China game is still not certain because of the lack of a fan base in the country (NFL games are played in the middle of the night in China). In regard to future games outside London or Mexico, Mark Waller stated in 2017 that the only holdup with games in Germany was what he dubbed "an inventory management thing. How many games do we actually have?" The success of the International Series has led the NFL to focus its global expansion aims on the possibility of having a full franchise located in London. While no set timetable has been set, the league is working on a goal of establishing a franchise by around 2021, assuming they have all the necessary arrangements in place. It is believed this would be most likely achieved through relocation of an existing franchise, with the Jaguars most often linked due to their association with the International Series, even though their owner is said to be content with the current arrangement and other franchises have more reason to move (the most often cited being poor on-field performance, lack of fans and uncertainty over stadium leases). The NFL has used some of the specific arrangements for the International Series games as a test bed for predicting how a London franchise could be made effective from a logistical and competitiveness standpoint. ^ Wilson, Ryan (July 8, 2015). "NFL, Tottenham Hotspur agree on 10-year partnership for NFL games". CBS Sports. Retrieved July 8, 2015. ^ a b "NFL extends deal to play games at Wembley through 2020". Associated Press. October 22, 2015. Retrieved October 22, 2015. ^ a b c d Associated Press. NFL commissioner says Super Bowl may someday be held in London ESPN.com, October 15, 2007. ^ Associated Press. 3 AFC, 3 NFC teams named possible 'hosts' in Europe ESPN.com, January 8, 2007. ^ a b c d Associated Press. NFL looking closely at expanding to 17 games with international flavor ESPN.com, May 10, 2007. 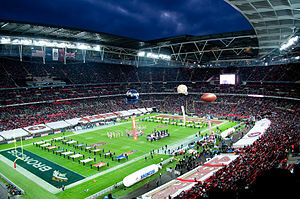 ^ NFL opts not to hold second game in UK in 2010. ^ Zimmerman, Brandon (August 28, 2013). "NFL Banking On 'Passion' Of U.K. Fans To Make London Expansion A Success". Sports Business Daily. Retrieved August 28, 2013. ^ "NFL owners OK games in Britain through 2016". Espn.go.com. October 11, 2011. Retrieved August 13, 2012. ^ a b "NFL clubs expand commitment to playing international regular season games". NFL UK. National Football League. Retrieved October 7, 2015. ^ Breer, Albert (May 22, 2012). "Five-year extension of Buffalo Bills' Toronto series approved". NFL.com. Retrieved August 27, 2012. ^ Associated Press. Bills to play annual regular-season game in Toronto starting next season ESPN.com, February 1, 2008. ^ "Fantasy Football 2017: NFL Bye Week Cheat Sheet". Athlonsports.com. Retrieved August 8, 2018. ^ "Chargers, Rams both lose over stadium delay". Profootballtalk.nbcsports.com. May 19, 2017. Retrieved August 8, 2018. ^ Associated Press. Despite poor weather and a sluggish game, the stadium remained packed and in good cheer for the entire match. Dolphins will play Giants in London on Oct. 28 ESPN.com, February 2, 2007. ^ NFL UK. ST. LOUIS RAMS TO HOST REGULAR-SEASON GAME IN UNITED KINGDOM IN EACH OF NEXT THREE YEARS Archived January 23, 2012, at the Wayback Machine NFLUK.com, January 20, 2012. ^ "St. Louis Rams will not play in London 2013, 2014". NFL.com. Retrieved August 13, 2012. ^ Ridge, Joe (November 14, 2012). "West Ham move into pole position for Olympic Stadium after NFL bid is thrown out". Daily Mail. London. Retrieved September 18, 2013. ^ "Tottenham Hotspur will host NFL matches at new stadium". BBC Sport. July 8, 2015. Retrieved July 8, 2015. ^ "NFL extends agreement to play regular-season games at Wembley Stadium for an additional five years". NFLUK.com. NFL Enterprises, LLC. Retrieved October 26, 2015. ^ "NFL action at Twickenham". England Rugby. Rugby Football Union. Retrieved November 3, 2015. ^ "Texans hoping to play international regular-season game in 2016". Foxsports.com. October 15, 2015. Retrieved August 8, 2018. ^ "Exclusive: NFL considering the Steelers to play in Mexico in 2016 - English". As.com. Retrieved August 8, 2018. ^ "Back to Mexico: Texans-Raiders to play Nov. 21 in Mexico City". NFL.com. NFL Enterprises, LLC. February 5, 2016. Retrieved November 15, 2018. ^ "History to be made in Mexico City". NFL.com. NFL Enterprises, LLC. September 28, 2005. Archived from the original on June 25, 2006. Retrieved August 7, 2006. ^ "2017 London Games: NFL announces which teams will be playing". NFL.com. NFL Enterprises, LLC. Retrieved December 13, 2016. ^ "Raiders to host Patriots in Mexico City next season". NFL.com. NFL Enterprises, LLC. Retrieved February 1, 2017. ^ "NFL announces three enticing London 2018 matchups". NFL.com. NFL Enterprises, LLC. Retrieved January 11, 2018. ^ a b Around the NFL staff (November 13, 2018). "Chiefs-Rams game moved from Mexico City to L.A." NFL.com. NFL Enterprises, LLC. Retrieved November 14, 2018. ^ Patra, Kevin (October 30, 2018). "NFL to play four games in London during '19 season". NFL.com. NFL Enterprises, LLC. Retrieved November 14, 2018. ^ Raiders most likely to play in Bay Area in 2019 at the stadium of either 49ers or Giants. CBS Sports. Retrieved January 12, 2019. ^ a b c d e "Goo Goo Dolls to perform at NFL Wembley game". NFL UK. October 12, 2011. Archived from the original on November 4, 2014. Retrieved November 4, 2014. ^ "NLF London 2012 Pre Game Show "Train" Wembley Stadium". Luke Dudley. October 29, 2012. Retrieved November 4, 2014. ^ "Tinie Tempah, Gene Simmons perform at NFL match". ITV News. September 29, 2013. Retrieved November 4, 2014. ^ Garnier, Jesse (September 29, 2013). "NFL gameday splashes across the pond". SF Bay. Retrieved November 4, 2014. ^ "DEF LEPPARD – NFL Pre-Game – Official Performance Video". DEF LEPPARD. October 8, 2014. Retrieved November 4, 2014. ^ "Little Mix perform before the NFL football game between the Atlanta Falcons and the Detroit Lions at Wembley Stadium, London, Sunday, Oct. 26, 2014". Yahoo! News. October 26, 2014. Retrieved November 4, 2014. ^ "Joss Stone to perform pre-game at Wembley". NFL UK. National Football League. Retrieved November 6, 2014. ^ "Ohio State University Marching Band to perform at Bills v Jags Wembley game". NFL UK. National Football League. Retrieved July 3, 2015. ^ "Music legends Madness to perform at Lions-Chiefs NFL game at Wembley". NFL UK. October 29, 2015. Retrieved November 1, 2015. ^ "No chilling this Sunday..." NFL UK. October 21, 2016. Retrieved October 21, 2016. ^ "2018 NFL London schedule kicks off at new Tottenham stadium; three teams to make UK debuts". NFL Communications. January 11, 2018. Retrieved January 11, 2018. ^ "Los Angeles Rams to host Kansas City Chiefs in Mexico City in 2018". NFL Communications. January 31, 2018. Retrieved January 31, 2018. ^ "Jess Glynne to perform London Games Kickoff concert". NFL.com. Retrieved October 6, 2018. ^ "NFL adds fourth game to London slate in 2019". ESPN.com. Retrieved October 30, 2018. ^ "NFL ponders second UK game option". BBC News. May 13, 2009. ^ "Murrayfield is game for NFL". Edinburgh Evening News. April 3, 2008. ^ a b "NFL could play in Germany by 2017, China by 2018". Nfl.com. Retrieved August 8, 2018. ^ Soshnick, Scott (May 19, 2016). The NFL Pro Bowl Is Moving to Orlando. Bloomberg. Retrieved May 19, 2016. ^ "Report: Los Angeles Rams' 2018 Home Game In China To Be Season Home Opener Against San Francisco 49ers". Turfshowtimes.com. Retrieved August 8, 2018. ^ "NFL aiming to potentially play game in China in 2019". Nfl.com. Retrieved August 8, 2018. ^ "NFL scraps plans to hold China game in 2018". Espn.com. Retrieved August 8, 2018. ^ a b Breer, Albert (September 21, 2017). Game Plan: NFL Believes London is Ready for Team; 2022 Target is Doable. SI.com. Retrieved October 1, 2017. ^ La Canfora, Jason (October 28, 2012). "NFL's move to London could come soon; Jags a target". CBS Sports. Retrieved February 20, 2013. ^ Campbell, Dave and John Krawczynski (May 7, 2012). Vikings in limbo and expansion not on NFL's radar. Associated Press. Retrieved May 7, 2012.